Here’s a guide to help you choose what size turkey you will need. Please keep in mind that this is an approximation only and based on no other protein being served. (a) Remove your turkey from the fridge 20/30 minutes before placing in the oven. Ideally it should be longer, especially with larger birds as a Summer Christmas in the Queensland heat isn’t best friends with raw poultry. You’ll need to be mindful of the heat and be careful of how long your bird is out of the fridge before cooking. (b) The best way to tell if your turkey is cooked is by using a digital cooking thermometer. The recommended internal temperature for cooked poultry is 75°C. Always double-check by sticking the probe in several different spots within the thigh or breast, to find the lowest reading. If returning to the oven, allow 10-15 minutes, then test again until the correct temperature is reached. (c) Without a thermometer, the classic way to test is to push a spoon under the turkey leg so that it pierces the skin (or use a skewer), and inspect the juices that collect in the spoon. The juices should be pale gold and clear; if there are traces of blood, return to the oven as above. 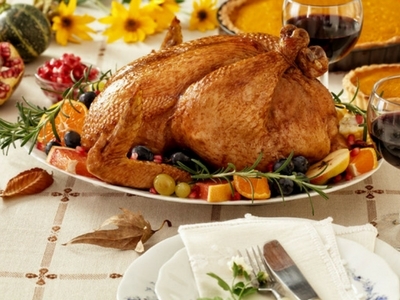 It is essential to rest your turkey for 30-45 minutes before carving (the temperature will continue to rise). Put the bird in a warm place, tented with foil. It won’t get cold – but it will become juicier, and easier to carve. (a) ALL SIZES START AT 200°C for 20 mins.